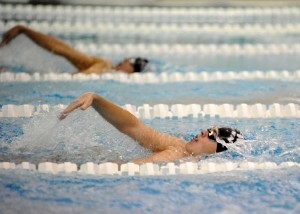 DUNLAP – According to Concord boys swimming head coach Tom Johnson, it has not been the most productive season thus far. But a 108-53 victory by Concord over Wawasee Tuesday night helped get the ship headed in the right direction. Concord won nine of the 11 events in which it competed, and did the winning in pretty convincing fashion. Behind the punch of six different individuals that won an event and all three of its relays claiming victories, Concord were never really threatened to pick up the team win. Which was a relief to Johnson following the meet. Johnson first pointed to the relays, where the combo of Brandon White, Andrew Hinds, Rees Paul and Stephen Krecsmar opened with a medley win at 1:47.64. Hinds, Zach Wright, Luke VanderVliet and Nathan Rose posted a 1:38.02 in the 200 relay, then Rose, Paul, VanderVliet and Krecsmar closed with a 3:33.21 in the 400 relay. Those combos did most of the individual damage, as well. VanderVliet won the 200 (1:59.41), Rose the 50 (23.49), Krecsmar the butterfly (55.16), White the backstroke (1:00.42) and Hinds the breaststroke (1:06.62). Alex Mark tacked on a win in the individual medley at 2:13.52. Wawasee’s Danny Allen (near) and Logan Haessig pace in the backstroke. Wawasee didn’t have much to whoop about on the sideline once diving ended around 5:40 p.m. Tristen Atwood was the lone diver, and was guaranteed his first-ever win in the event with a score of 120.05 unopposed. Following a 45-minute delay due to technical difficulties with the scoreboard before swimming commenced, Wawasee wouldn’t pick up a win until event 14 nearly two hours later when Zac Hershberger ripped to a 51.77 win in the 100, just .10 faster than Rose who had a slight lead heading into the 75-yard mark. 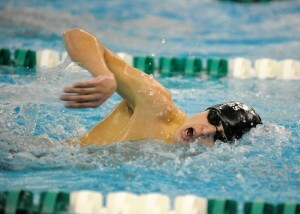 Jaxon Bame of Wawasee works the final 25 yards of the 200 freestyle. Wawasee’s only other win came in the next event, the 500 free, which Logan Brugh held off Krecsmar and Mark for a 5:05.65 clock. With just three meets and 11 competition days into the season, Wawasee head coach Julie Robinson wasn’t overly concerned with the lopsided scores. 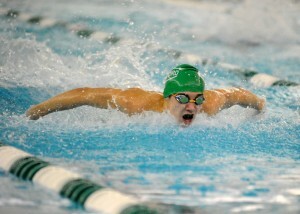 “Some of our experienced swimmers had really good nights, like Logan in the 500 and Zac in the 100,” Robinson stated. “I had a lot of other boys put together lifetime bests tonight. We are just a really young team that is still moving around, still trying to figure out where to put them. Wawasee (0-3, 0-3 NLC) will face NorthWood and Plymouth next week before hosting its invitational heading into Christmas break. Concord will meet NorthWood this weekend before anticipating dates with Elkhart Memorial and Penn ahead of its holiday break.